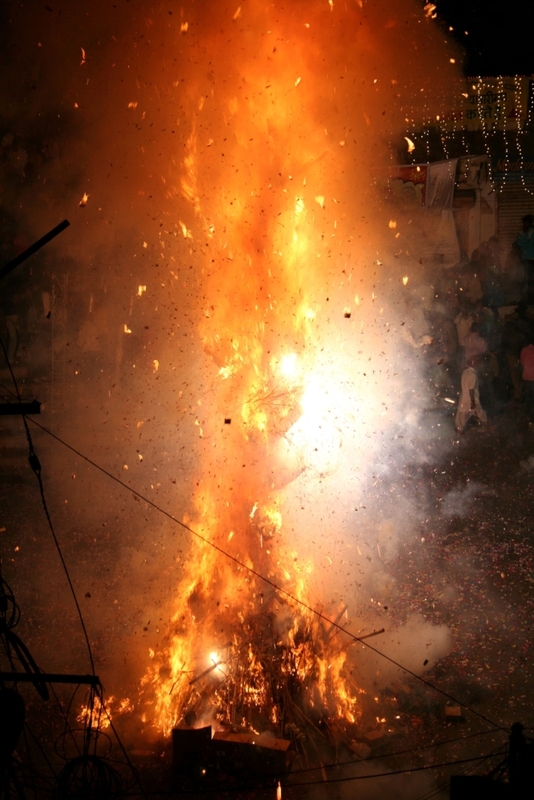 Holi Bonfire in front of Jagdish Temple / Udaipur; photo by Ingo Mehling via Wikimedia Commons. February’s Full Moon is a penumbral eclipse in tropical Leo. As we enter the beginning of the first 2017 eclipse season, you will notice a quickening of circumstances around you. Eclipses have the effect of acceleration, and if you’re mindful of this process, you can make a lot of progress. However, it’s often difficult to use this energy externally because the eclipse, especially lunar, is so focused inwardly. Quite often, we can make some breakthroughs within ourselves by reaching new levels of emotional and personal expression. Consider the archetype of the Moon--the womb from which life emerges. The Moon symbolizes nurturance, domesticity, and the expression of empathic feelings. The Moon is a safe place, but also a place of great mystery. The secrets of life and death are contained within the lunar archetype, and like the tides, the Moon is a symbol of endless change and transformation. This quickening of energy often feels that way. Things around us are passing away and coming into form at a much faster rate. Internally, there is the awareness of some new capacity for deeper feeling and heightened psychic awareness. This is a moment to get more in tune with the irrational aspect of the psyche and to look more closely behind certain facades. In the sign of Leo, this lunar eclipse can quicken creative insight and expression. It can generate feelings of spontaneity and playfulness. Consider what it is that’s been preventing the flow of joy in your life or your ability to have fun. This lunar eclipse can help release those blockages by helping you become more aware of them. With Jupiter making a sextile to the eclipse and a trine to the Sun, there are opportunities to make some creative advances with some help or assistance from others. The eclipse forms a fire grand trine with Uranus in Aries and Saturn in Sagittarius. A trine from Uranus to the Moon can give innovative insights and unique perspectives. It also enhances restlessness with the status quo and the desire to rebel against anything overtly restrictive. Saturn in Sagittarius can help keep you grounded, practical, and focused on integrating creative insights concretely. This powerful synergy of fire energy creates a surge of enthusiasm and excitement. If you’ve been in need of something to push you out of a rut, this lunar eclipse has the potential to get things moving in a new and dynamic way. The fire archetype has the power to bring some life back into current circumstances. Mars and Venus loosely conjunct in Aries gives an extra boost to the inner will. Lastly, Chiron and Pluto form a yod aspect with this lunar eclipse/Full Moon. This further amplifies the subconscious dimensions of this Full Moon, as well as breathing new life into our home environment, routines, and our relationship with the irrational. While there are a plethora of easy flowing aspects to this eclipse, these quincunx aspects to the Moon speak to the work required to bridge insights from the unconscious into conscious awareness. That may require taking the initiative to listen carefully to messages emanating from your dreams or your environment. Remember that such content isn’t easy to accept or readily understand. Getting in touch with your deeper self has the capacity to reinvigorate your personal life, potentially leading to some much needed breakthroughs and changes. You did not come to Earth without a guide. Evolutionary Astrology is a powerful tool for self-discovery and an exceptionally helpful guide in times of uncertainty, crisis or stagnation. Click here for reading options and pricing. Follow me on Instagram for weekly astrological updates.